Today’s profile builds upon the usual “Assessors in Action” section to spotlight a particular category of inspector – those who have boldly chosen to include a Home Energy Score with every inspection report. We’re recognizing the whole-hearted commitment of this ever-expanding group by dubbing them “All-In” inspectors, and the first name on the docket is Rose Buckley. If you’ve been living under a rock and haven’t heard of Rose, her profile in last month’s ASHI Reporter is a great place to start. We caught her between inspections recently to get a feel for how this 100% approach is working for her business. How do you market The Score? I’ve built up a pretty solid platform on Facebook, Instagram, LinkedIn, etc., so it’s easy for me to get the word out about my services and to explain the HES process and its benefits that way. I also really try to find new ways of getting “facetime” with my agent network, and I’m finding that a lot of offices are really interested in the topic of energy and they’re inviting me to show up and speak. Another pleasant surprise is that after I explain to the homebuyer and the agent on site what the Score is all about, that agent often becomes my best “marketer” to the rest of their office! How has being a Certified Assessor™ affected your inspection process? Since I collect about 90% of the information required for the Score as part of my normal inspection process, it probably only takes me an extra ten or fifteen minutes in total to collect the information. Big or complicated homes might be more than that, since I do have to take a few measurements, and I was definitely slower in the beginning. Once I had probably ten Scores under my belt, though, the process really came together and now I’m at most twenty- or thirty-minutes total to deliver a report. It’s a small enough impact that I haven’t raised my base rate yet, but I might do that since I’m seeing that the value of the Score justifies a modest increase. 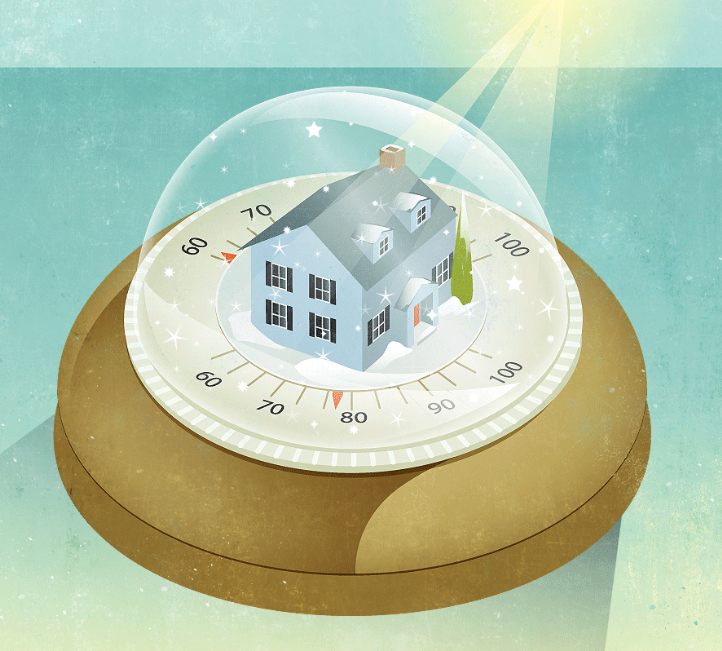 How do your clients feel about receiving a Home Energy Score? Your agents? So far, I have to say that both homebuyers and agents respond very positively to the Home Energy Score. It’s just such valuable information for a homebuyer to have, since they tend not to have given much thought to how much they’re going to have to pay for utilities, or to what they can do to reduce those costs if they buy the home. That’s not to say that the Score doesn’t sometimes bring some “hard truths”, though – not every home is a good energy performer. I learned early on to set expectations that way, since it’s easy to tell that some homes – if they’re very old, poorly insulated, have end-of-service-life HVAC equipment, etc. – are going to get low Scores. What’s interesting is that buyers of those homes seem especially grateful to have the information, and I’ve yet to see the Score become any kind of “deal-breaker.” The agents notice that, too, and I think it just kind of shows them that I care about giving the best possible service and the most valuable information to our shared client. We know from hearing from out network around the country that the Home Energy Score delivers benefits to inspectors in three main categories, and our team has been working throughout the “off-season” to bring some tools to the table that let our clients make the most of all of them. First, most successful inspectors know that their agent network is one of the biggest factors toward maintaining a consistent client flow, and that remaining “front of mind” with this group is a constant challenge. We have been pleased to see that the HES has proven to be an effective “foot in the door” for inspectors who do outreach with their agent networks, and while the DOE has always provided a “canned” presentation designed to meet this need, we recognized this well-intentioned content as too generic for the hard-to-please agent audience. Inspectors require something more specialized to the agents, something that speaks directly to their needs, and that’s why ID Energy’s new agent PowerPoint that can be customized to specific time ranges and delivers punchy, impactful info to agents detailing why the Score is good for their clients and their businesses without a lot of extraneous government-speak filler. That presentation is available now, and we are on hand to help with visual co-branding and audience-specific editing services. Next on the list is a marketing task that no inspector has much time to bother with – creating effective collateral material that quickly explains the benefits of a given service. The DOE-provided materials are adequate for this task in a pinch, but again we saw an opportunity to deliver something that would really work for the inspector industry that we know so well. Our new hand-outs and flyers stylishly get the key points across to agents and potential clients, while highlighting the technical expertise and credibility that the Certified Assessor™ title confers. Finally, inspectors need certainty around the issue of whether the services they’re delivering really matter to their clients. 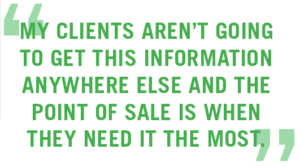 After all, it’s one thing for an inspector to hear that the Score is valuable for someone else’s customers in a different market, but that’s not the same as knowing for sure that your customers are valuing it. To address that need and to enable savvy inspectors to know that they’re delivering the right mix of services, ID Energy is now providing a custom, co-branded Home Energy Score Report Template that not only livens up visual presentation of the standard (and somewhat clinical-looking) Report, but also includes a section where clients are able to rate their satisfaction with the Score, and provide any further comments about their experience. Feedback from buyers thus far has been very positive, and now ID Energy’s network will be able to know without a doubt whether they’re making a smart move by providing the Score. You may be a reader of the ASHI Reporter magazine and regularly see our monthly Home Energy Score column. The March 2019 issue broke down some new data collection features, like our new one-page data collection and photo checklist sheet (the analogue app), but also highlighted the long-awaited Home Energy Score app for iOS devices. As stated in the issue, the new iOS Home Energy Score app was set to “drop” this week. Unfortunately, the U.S. Department of Energy issued new updates to the scoring tool technology last month and have another round of updates planed for this spring. To ensure all of I.D. Energy clients receive the best possible experience and performance, we have decided to delay the app release and integrate both current and future updates. At the time the ASHI Reporter March 2019 article was written, we were unaware of the updates and delay, I apologize for the announcement as it was already sent to print before we could amend the content. Featured in the October 2018 ASHI Reporter Magazine. In the year that led up to that event and every day since, Gordon has been using the Home Energy Score to produce happier customers, and a better bottom line for Inland Lakes Inspection Services in the Metro Detroit and mid-Michigan areas, where he’s been inspecting homes for 20 years. We caught up with Gordon recently to talk about the inspection industry from a veteran’s perspective and the role that the Home Energy Score is playing in the continued success of his business. Gordon’s path to proprietorship began as a 15-year employee for a major national inspection firm, so he’s earned the freedom to craft a special suite of services that has garnered a solid reputation for top-shelf expertise and professionalism for Inland Lakes. Any inspector who’s entering their third decade in the trade is going to have a pretty good sense of what homebuyers expect out of an inspection (hidden, expensive repair projects, and health and safety items are a given), but what sets Gordon apart is a willingness to move beyond what’s expected into a type of service that delivers what buyers truly need, even when they don’t know to ask for it. That’s definitely the category that the Home Energy Score falls into for Glidden’s thriving business and we’ll cover the basics of how he puts that into action below. Why the Home Energy Score? He’s not banking on any imminent policy mandates to justify his embrace of the Score, however, because he sees so much value in what the Score delivers to his homebuyers even without incentives. For example, because Michigan has yet to update some of its building energy codes and utility energy–efficiency programs, Gordon uses the Score to help compensate. Like many inspectors who have made the Score an integral part of their business, Gordon has become very efficient at providing energy–efficiency information to his customers. “It takes me about 15 minutes extra,” he says, “and it will be even less when the iPhone app rolls out.” Gordon credits his use of a laser tape measure to streamline the measurement data needed by the DOE and he cites the top-notch ID Energy scoring tool as another contributing factor behind his speedy delivery. Black Friday, Small Business Saturday and Cyber Monday are the deal days of the year, but I.D. Energy is going a step further by giving you the WHOLE WEEK to save big on training for the Home Energy Score! Today through Monday the 26th get $50 off the Fast Track Training Package and become a Home Energy Score Certified Assessor™. This is the last deal of the year so take advantage of it while you can, and keep in mind that you don’t have to actually take the training during this busy holiday week – just sign on now to cash in on the low rate and then jump into the program whenever you’re ready! Get $50 Off Fast Track Training Now through November 26th! The fast-growing city and county of Denver, Colorado is launching a major addition to its Home Energy Score program, which now will pay home inspectors to provide one thousand Scores to homebuyers in that market over the coming year. I.D. Energy will be managing the rollout, so inspectors in the area should watch for details as to how to get involved. Denver will be looking to prove what many inspectors working with the Score already know – homebuyers really value having energy performance info about the homes they’re looking to buy, and are willing to pay for it! To access the Official Request for Information please see our Assessor Resources Page. Read more in this New York Times piece about why many home inspectors end up taking a back seat to energy auditors when they’re not trained to have the energy conversation. 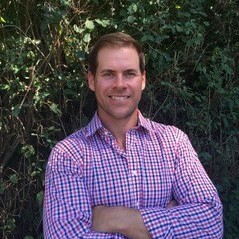 Brandon is a freshly-minted inspector working in the Twin Cities market. Despite having spent the last 15 months immersing himself in as much technical information and training as possible, his energetic sprint though the Fast Track training and his enthusiasm for the Home Energy Score made him an easy pick for this month’s snapshot. I use Home Inspector Pro software, and when I saw that the Score is built into the software, it was an easy decision to jump on board. I’ve learned so much in the past year about how homes work, and the Home Energy Score training was a big part of that education – I pulled some solid building science knowledge out of that training! I think that anyone who is really serious about being a home expert needs to have expertise in energy performance and comfort, and Home Energy Score is the perfect first step down that path. How do you work the Score into your marketing and inspection process? At my stage in business, I need to get out there with as much credibility as possible, and being able to call myself a Certified Home Energy Score Assessor is a real confidence-builder, especially since there aren’t many of those in my market yet. I’ll be using the U.S. DOE brand in all my customer-facing materials – it’s one of the key benefits of being in the program, in my opinion. And I’m not going to get too fancy with packages or upselling it as an ancillary service right now – I’m just including it in every inspection. It’s a bit of extra work on site, for sure, but I’m getting quicker with it and so far the payoff is worth the added effort. What do your clients think about the Score? I’ve been an electrical lineman for the past 17 years, and the best thing about that job was delivering to people something that they really need and are grateful for. And even though getting information about how much energy a home is going to use doesn’t have the urgency of getting the heat back on for a homeowner, I get the same feeling of satisfaction from delivering truly helpful and important information to people who are making a huge decision in their lives. People are thankful to have the information that the Score provides, plain and simple, and that makes me feel good about the service I’m giving them. I’ll be honest – most of them have never heard of it. For me that’s a good thing, since it gives me a great way to teach them about a part of the industry that they’d like to better understand. 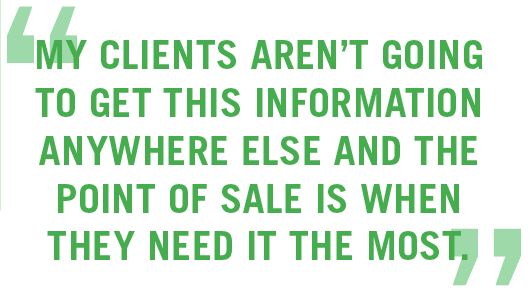 They do tend to appreciate that their buyers are getting “greener” all the time, so they’re pretty receptive to learning about ways to respond to those clients. I think that being a Certified Assessor makes me look professional and competent to them, and they can tell how excited I am about giving their clients the best possible service. Everyday, I get hit with folks that believe that energy innovation is bad for the United States and the people who live in it. Policies that promote solar, wind, and energy efficiency are actually great for Americans. In fact, California, New York, Massachusetts, North Carolina, Colorado, and other clean energy leaders rank as some of the most affordable places to live in terms of energy costs. Did you know that for 25 million households, energy costs in the United States could eat up 22 percent of a families’ total after-tax income. And because of dismal energy efficiency in some states, lower unit energy prices don’t necessarily equate to savings. Where we live and how much energy we use are a big part of the equation. For instance, although electricity is relatively cheaper in Southern Louisiana, its scorching summer heat raises costs for residents compared with the temperate climate in more energy-expensive Northern California, where heating and cooling units stay idle most of the year. To better understand the impact of energy on our finances relative to our location and consumption habits, WalletHub compared the total monthly energy bills in each of the 50 states and the District of Columbia. Their analysis went beyond just electricity and included natural gas, motor fuel and home heating oil as well. The highest cost state in the country is: Wyoming, the state where folks drive more than anywhere else, would benefit from more fuel-efficient vehicles. 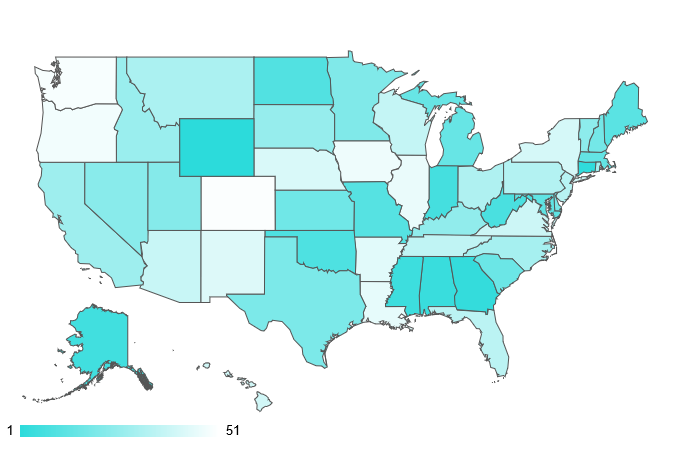 The more surprising states on this list are coal-heavy states in the South. Southern Company owns the utility companies in Georgia, Alabama, and Mississippi. They have far more expensive electricity bills than California. You would think that the politicians and utility company would work together to help folks with energy efficiency like better insulation that would reduce air conditioning bills, but you would be wrong. Rounding out the top ten are more energy heavy states like West Virginia, Oklahoma, and North Dakota. I have no idea why Indiana is in the top ten at all…wait yes I do. It is because the utility companies defunded energy efficiency to the point of almost killing the program. One of the great benefits of being a Home Energy Score Certified Assessor is the privilege of associating your business with an entity as credible as the U.S. Department of Energy. The DOE and the Home Energy Score team have some nice branding materials available to their assessors, too — a variety of logos, flyers, scripts and other materials await every new assessor once they’re brought into the program. And while the Home Energy Score team provides resources to a wide range of professionals — energy auditors, utility employees, state and local government programs — I.D. Energy focuses on the home inspector industry, and as such has special insight into what actually works for home inspectors when they’re on the job looking to make the best use of their various services and partnerships. So it’s in that spirit that our cracker-jack graphics department put together a new logo that’s specially designed for inspectors. 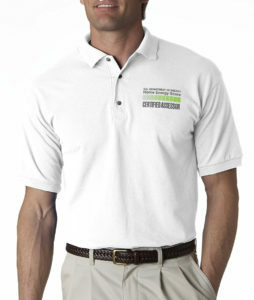 It carries the “certified” language that homebuyers respond to, and is shaped to allow easy incorporation onto business cards, vehicles, shirts . . the works. 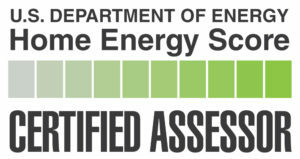 The Certified Assessor Logo is just one example of the Exclusive Marketing Suite of resources that ID Energy has put together to help inspectors build their businesses with the Home Energy Score. Check out our “Assessor Resources” link here, and watch this space as we continue to bring on new tools and tactics! Policy, tech tidbits, nerdy stuff. The Home Energy Score Assessor webinar, conducted on July 12th, was a great success with over 140 participants. A quick glance at the Home Energy Score Home Inspectors who are makin’ it work! John Rodkey is one of the highest-producing Home Energy Score Assessors in the country right now, and you can read a full profile of his work with the Score in this recent ASHI Reporter article. Let us know if you’re one of the many home inspectors whose business is growing because of Home Energy Score, and we’ll see about getting you in an upcoming profile! 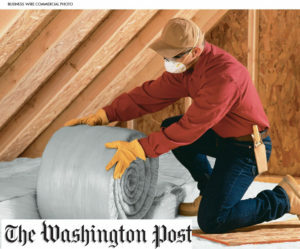 I never liked not having a good way to warn buyers that they were getting into an Energy Hog of a home. I know that they don’t like paying high utility bills any more than I do, and now I can make it clear to them what they can expect that way. Also, I thought that it would be a good way to close more jobs, and that’s proven to be true. I don’t make a big show of it on the marketing side; mostly I just tell people that as part of their inspection they’re going to get a Home Energy Score report from the U.S. DOE. I can’t put a number on how many more jobs it’s helped me close, but it has definitely led to an improved closing rate for us. I’m already collecting almost all the information that the Score requires, so it hasn’t made a big impact on my inspection process. I’d put the additional time needed at less than 30 minutes total. Practically every time, their reaction is something along the lines of “Wow, that’s really helpful –thanks!” It hasn’t proven to be any kind of “deal killer” when the Score is on the lower end, either – people just really seem to be grateful to have the extra information and the recommendations for improvements. I already have a reputation with them for being very thorough, homebuyer-focused, and on the cutting edge of the most important new services. Some of them were wary at first, but it gives me something to teach them about, and in the end if the buyer is happier with my services it benefits them, too. Most of the better agents see it as a positive addition at this point. Read the full ASHI Reporter article. Keeping Home Energy Score tabs on the national media beat. As the generation with the largest and most diverse share of the U.S. population, Millennials are shaping industries to improve the nature of our culture and the products in it. The real estate industry is no exception. The millennials were the largest group of home buyers (34 percent) for the fourth consecutive year, according to NAR’s 2017 Homebuyer and Seller Generational Trends study. As this group is buying homes later in life than previous generations, it is only natural that they will continue to lead the market, at even higher percentages potentially. Millennials show vast distinctions from previous generations but there are some particulars that stand out. Read the Entire Article by Brent Loya in the Summer Addition of Working RE Home Inspector Magazine. One of the great thing about bringing the Home Energy Score into your inspection business is that you can sell it any way you want to. I.D. Energy works with inspectors across the country who have adopted different ways of selling the Score to improve their services and their bottom line, and they’ve put together a short new video to share how the most successful practitioners are making it work – have a look! The Home Energy Score has partners in major U.S. cities who are boasting the hottest housing markets or most trend-setting policies, and it’s time to take notice! Home inspectors in Portland have established themselves as the best source for providing Scores to homebuyers this year through their new ordinance (there have been over five thousand delivered). While not an ordinance, Denver, Colorado kicked off a pilot in May that has had early success raising awareness about the value of a Score. High-profile initiatives like these make the Score more credible and marketable for every Assessor in the country. Read about the Denver initiative here, and make sure that you can answer “yes” when your next client asks if you provide a Home Energy Score! Rigid Inspections, LLC. Founded 2016. Ability to offer a service that nobody else provides; even if not a “one-stop shop”, to be able to demonstrate a wide variety of expertise to potential clients. To offer a service that can truly save my clients money and deliver a better living experience in their new home; confident that I’m getting in on the front-end of an important and growing market shift. Feature it prominently on company web site, which is where much of my business is derived; no “hard sell” on this or any ancillary services; charge additional $50 to cover additional effort involved. How does it impact your process? Score is not yet integrated into Spectora inspection software (editor’s note: Spectora is on the list of providers to be targeted asap for software integration with the HES), so data entry takes a few extra minutes; upcoming iPhone app will also address this issue; I’m already collecting most of the information necessary to produce the Home Energy Score. What the Public Broadcasting Service lacks in excitement they make up for with levelheaded respectability and sheer audience size. So, when that esteemed outlet holds the Home Energy Score up as one of the best first moves for people to take when trying to improve their home’s energy performance, it’s a good day for every HES Assessor across the land. 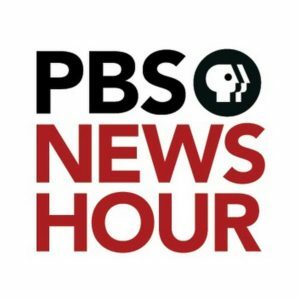 The current PBS article makes the very reasonable – but not very well understood – point that every home exhibits unique performance issues, and that homeowners/homebuyers aren’t well served by following cookie-cutter advice about how to make their homes more energy efficient, comfortable, and healthy. What they need, rather, is a real pro on site to tell them what particular measures they should undertake, and in what order. Read the article to see a good example of how the Home Energy Score’s profile is increasing across the country, as is the value of the expertise that HES Assessors bring to the table every day. Inspector collects all necessary Home Energy Score (HES) data during the initial home inspection, and files it away for safe keeping (time required = extra 10-15 minutes on average). Six months or so after the home buyer moves in, the inspector “checks back” with the client to offer a Home Energy Score now that they have lived in the home long enough to know its “energy performance” (read: utility bills and comfort issues). If the homeowner accepts, the HES report can be generated without having to return to the home (time required to enter data = 10-15 minutes on average) and delivered via email. It’s a very low-pressure sales approach, one that is extended to the homeowner long after the hectic home-buying process is over and the client is in a more confident and receptive state of mind. It’s flexible, and can be offered for a fee or even as a no-charge service, since the time involved is so minimal and there’s no extra travel. It gives them something they actually need, since they’re typically either underway toward home improvement projects or are planning them, and the Home Energy Score tells them (using U.S. DOE-generated recommendations, not inspector-generated) how best to spend their efficiency-related upgrade dollars. It can be used to build relationships with both homeowners and real estate agent networks, depending on the inspector’s needs. If an inspector is especially focused on building a strong bond with a Realtor, for example, they can allow the Realtor to offer this high-value follow-up service, which can be delivered either through that grateful agent or through the inspector himself. Any way you slice it, the No-Travel Check-Back is an innovative way to put the particular benefits of the Home Energy Score to best use. Give it a try and tell us if there are even more ways to work the Score into your business! As you’ve probably heard by now, there’s a new sheriff in town in Portland, Oregon. 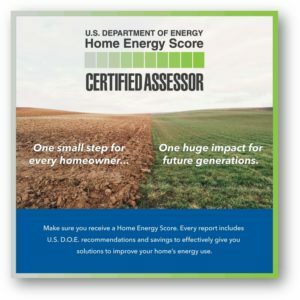 The first major U.S. city to require a Home Energy Score as part of any home sale, the 2018 ordinance has inspired glorious hope in the hearts of home inspector/assessors throughout the city, and an equal measure of dread from the listing agents who see the rule as a great way to ruin a perfectly good home sale. Of the 1800 or so homes that have been completed so far, the average score is 4.4, or just below the national average of 5. Recommended improvements take the average home above a 7, which is projected to save over $300 per home. These kinds of figures are proving both helpful to home buyers and not-so-scary to Realtors — which is the whole idea, after all. Feedback from the field confirms that home inspectors-turned-HES-Assessors are mastering the process of gathering information and delivering Scores efficiently, meaning that several Scores can be generated every day. Prices for the service are in keeping so far with early projections – around $200 for a stand-alone Score, and many operators are bundling it with additional features. As we’ve said, early indications are that home buyers are grateful to receive the information that the Home Energy Score provides: how much they can expect to spend on their utility bills, for one, and also how best to spend their energy upgrade dollars when the time comes for those projects. And here’s the good part – once home buyers have this kind of info in their hands, it turns out that they’re still willing to buy homes, and maybe even more willing. It will take some time to crunch the Portland data in detail, but we can say even now that the home-selling sky is definitely not falling in the City of Roses. The Home Energy Score has been recognized over the years as a valuable service for efficiency-minded homeowners and homebuyers, but now that the program is really catching on (there were 50% more homes scored across the country at the end of 2017 as compared to 2016) some prominent media outlets are starting to take notice. When it comes to analyzing a home’s energy performance, more detail does not necessarily equate to a more valid “energy audit”. Citing the Home Energy Score as an example, the article notes that the Score has proven its ability to deliver an accurate “snapshot” of a home’s energy features and potential for improvement even though it can be completed by a home inspector in only a few extra minutes’ work as part of a normal inspection. Energy performance speaks as much to occupant comfort as it does efficiency, and homeowners need expert guidance to steer them away from common misconceptions. It was a drafty room rather than high bills that drove the writer to an energy auditor, for example, and her assumption that windows were the culprit (a home energy myth if there ever was one) was corrected by her energy expert, who explained that insulation and air sealing were far better first steps to address her uncomfortable rooms. More and more homebuyers are seeing the wisdom of the latter sentiment as they seek out high-performing homes to buy and full-service home inspectors to protect them in that decision — here’s hoping that your business is ready to head the Home Energy Score call. What happens when a major city goes full-bore with The Score? 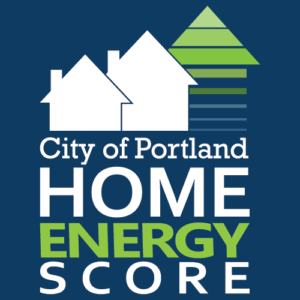 For those who haven’t heard, the city of Portland, OR broke new ground when it adopted an ordinance last year stating that beginning in 2018 all single-family homes listed for sale will require a Home Energy Score that can be presented to prospective buyers. Portland-based home inspectors are of course a natural fit to serve this new market (listings are projected to number in the 14K range for 2018), and dozens of businesses signed up with ID Energy’s Home Energy Score “FastTrack” in the latter half of 2017 to get ready for the big push. And while the policy has only been in place for a few weeks, the inspectors who’ve spoken to us are positively “energized” at the Score’s potential to build business. Jonathan Wrobel with Portland Home Energy Score recognized a big opportunity when he saw one, but was worried that the Scores would take too long to profitably perform, and further that his hard-earned Realtor network would be hostile to the idea. 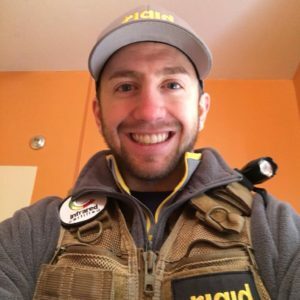 Wrobel’s an enthusiastic graduate of the ID Energy Home Energy Score FastTrack (“quick and easy . . a very positive experience”), and sees the HES as a key part of the inspection industry’s future. He sees that future being driven both by forward-looking public policy like Portland’s and by ever-savvier homebuyers who refuse to enter into such a high-stakes purchase without being fully informed about every aspect a home’s performance. 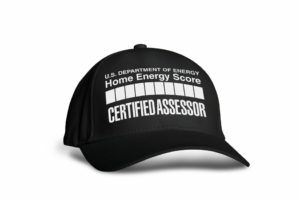 One of the great benefits of being a Home Energy Score Assessor is the privilege of associating your business with an entity as credible as the U.S. Department of Energy. The new Inspector Logo is just one example of the suite of resources that ID Energy has put together to help inspectors build their businesses with the Home Energy Score. Check out our “Assessor Resources” link here, and watch this space as we continue to bring on new tools and tactics!